for League/Tournament info & updates in Texas ! FAQ's on soft shell helmets? 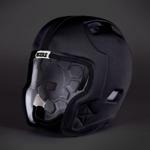 We understand that a soft helmet is an additional cost, but two years ago they were 79 dollars and we have now gotten manufactures down to 50 or the ability to rent. So until Aug 1st we have reduced registration fees for all teams and players. With Gloves the price of $40 I don't think $50 to protect your head is too much considering that you can can get two to three years use out of each soft helmet. I recommend two manufactures (1) Rocksolid is number one on my list as they are local based in Frisco and have ties to the Cowboys as they Office at the Star. What that means is if you have an issue they have a local staff that can help you with orders, sizing, colors or logo. You don't have to communicate with someone in a different time zone and then worry about shipping. (2) The other is Gamebreaker as they make a good helmet too but are based in CA. ©2019 Texas Elite 7 on 7 / SportsEngine. All Rights Reserved.